Based in Gotham, I provide chimney sweeping services for South Nottinghamshire and the surrounding area. Besides South Nottingham, East Derby and Loughborough, I also serve villages such as East Leake, Costock, Kegworth, Keyworth, Ruddington, Castle Donington, Melbourne, Breedon on the Hill, Worthington, Hemington, Shardlow, Aston on Trent. I use a 'power sweep' system to provide a clean, efficient service. 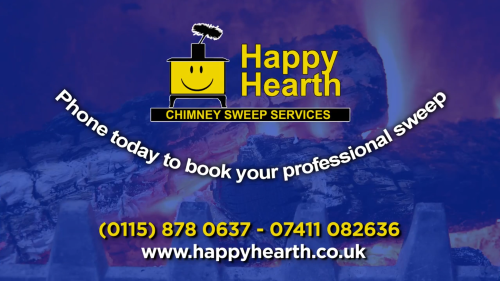 Institute of Chimney Sweeps accredited, Happy Hearth is here to rejuvenate your chimney and fire! As a Lucky Sweep, I also attend weddings across the wider Midlands area. Offering a bespoke service including a song for the bride and groom, Happy Hearth will make your special day even more memorable. Give Happy Hearth a call, we are always delighted to hear from new and existing customers. 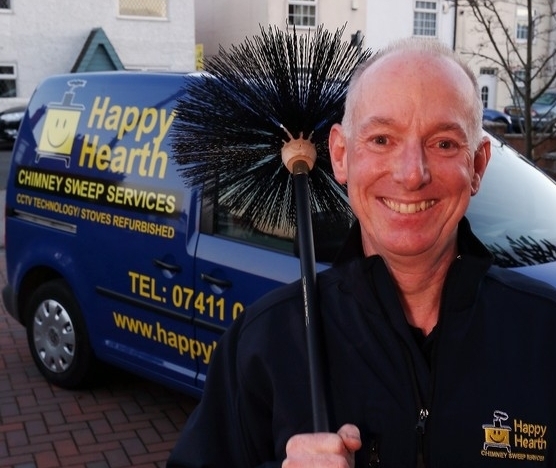 I would happily recommend Tom from Happy Hearth as a top quality chimney sweep. His work is very clean, he is reliable and polite and he really takes a pride in what he does. What more could you ask for? Tom has swept the chimney of our logburner twice now and we would not hesitate to use him again. He is always prompt, cheerful and comfortable to have around. And his prices are very good too! Tom at Happy Hearth has been sweeping the chimney to my log burner for some time now and he always does an excellent job. In addition, he has also repaired and renovated the log burner as it was getting past its best. As a result, the fire now burns as well as it did when I bought it. All of this at very reasonable prices and with a smile! Tom attended our family wedding near Cotgrave in May 2017 as a lucky sweep and what a fantastic job he did! He delighted the bride and groom with a few verses of “chim-chimenee” and gave the bride a lovely necklace as a keepsake. Would thoroughly recommend Tom as a lucky sweep. He really helped to make the day a special one! Tom has been sweeping the log burner in our bungalow now for three years and it’s always a pleasure to have him around. He’s polite, respectful of our house and very clean and tidy. Keep up the good work Tom and I’ll get the kettle on! We have been using Tom at Happy Hearth now for three years and we wouldn’t go anywhere else. He’s always very cheerful and a pleasure to chat to; his work is very thorough and he leaves no mess whatsoever. What more could you ask for and all for £40.00? No hesitation in recommending Tom – indeed we already have to our next door neighbours and now they use him! We used Happy Hearth for the first time this April (2017) and we were delighted with the job Tom did cleaning the chimney to our open fire. He left no mess and he was very thorough, checking that all was well after sweeping by checking the draw of the chimney with a smoke pellet before leaving. We would happily recommend Tom. I was one of Tom’s very first customers when he set up Happy Hearth in October 2013 and I have used him ever since. He turns up when he says he will, provides a clean (and very cheerful) service and is extremely good value for money. If I’m busy I’ll leave him the house key so he can get on with the job and he always treats my place with respect. For a friendly, reliable service from a professional sweep. If you have any queries or want to request a quote, get in touch!